The hills in and around Pretoria have always been a distinctive topographical feature of the city, where many of its symbolic elements are to be found. Some of the city's more desirable residential areas are also situated on the lower reaches of these hills. House du Plessis can be found in such an area, just northeast of Fort Klapperkop.The views are also mostly in this direction. The site is a subdivision from a larger residential stand and can only be reached by means of a long pan-handle, which is located much higher than the house on the original property. There are a series of terraces located here, and the footprint of the house has been organised into an L-shape, leaving a near-courtyard space as entry. It is as if the original terraces inspired the stepped section of House du Plessis, which has essentially been designed around the section and manipulated to maximise views and natural light. The roof terraces created in this manner provide ample areas for outdoor living, all of which focus on the views of the city below. The house has been constructed mainly from exposed concrete and red brick. 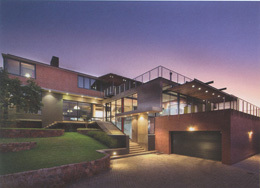 This choice of materials extends a much-loved and respected Pretoria building tradition. Detailing is bold, strong and without fuss. The upper level has a long clerestory window, extending almost the whole length of the house.This surprising light source, coupled with a focus on the view, creates the illusion of floating weightlessly in space high above the landscape.